When I first started quilting I made a big, giant quilt and backed it with (what I thought was) warm, snuggly flannel. I had pre-washed the fabric, but after a couple more runs through the washing machine the flannel became much less snuggly and more scratchy. Since then I have used flannel to back a few quilts (see here and here) with wonderful results, but I am always nervous. A few weeks ago I contacted every fabric manufacturer that I could think of and asked if they would send me some flannel so that I could test and compare the results. I also purchased a yard of Joann's flannel in order to compare quality with inexpensive flannel. I received fabric from the following manufacturers. In order to compare the fabrics I first cut 2 pieces of each print and then washed and dried the flannel and measured the shrinkage. I then cut two 10" squares from each print and sewed them together to enclose the raw edges so that I could test how the fabric held up to repeated washing. Each of them was included in every load of laundry that I washed and dried this week (6 loads total). Before I get to the details, here are a few tips about working with flannel. Other than adding some bulk to the quilt, I have not found flannel to be more difficult to work with than regular quilting cottons but these tips should help if you do have trouble. ***Please ignore any variation in color, I had trouble getting the color balance correct for some of the photos but there was no significant fading or change in color for any of the fabrics. The Cloud9 flannel (which is made with organic cotton) was the sturdiest feeling flannel that I tested and very soft pre-washing. Also, those foxes are incredibly adorable. The colors held up really well after repeated washing and even though there was some tiny pilling, the fabric remained very soft and substantial feeling. This would add some nice weight to the back of a quilt. This was my personal favorite flannel to work with. You can find Cloud9 Flannel here, here, or here. These foxes have gotten hard to find but they will be available in new colors soon! The Dear Stella flannel is a little lighter weight than some of the others but got softer and softer the more it was washed. The colors held up well and this particular print would be great for a more masculine quilt. This would make a very snuggly quilt back. You can find Dear Stella flannel here and here. Free Spirit flannels are the ones that I have the most experience with and knew that they wouldn't disappoint. I was surprised that this flannel was the thinnest that I received, but it was also the softest and it remained that way after washing. This flannel also had the least texture change after washing. You can find Free Spirit fabrics here and here. The flannel pictured here is from Parson Gray's new collection which will be available soon. I wanted to test Joann's flannel to compare to the others. This is definitely the least expensive (I paid $2.49 for a yard of this) but it was also the lowest in quality. It had the loosest weave and was the least soft. While it would be tempting to use this less-expensive option, I don't think that this would hold up well as a quilt backing. 5.4 oz. cotton flannel 42/43" wide. I have not used Riley Blake flannel before but they have lots of cute flannel options so I was excited to try this one out. This fabric was a little floppier than some of the others, but had a great fuzzy texture. I conducted a very scientific test where I had my 5 year old daughter close her eyes and choose which texture she liked best and this one was her favorite. You can find Riley Blake flannel here and here. I had recently used Remix Flannel to back a quilt and was impressed with the quality so I wanted to see how one of the brighter prints held up. It is hard to tell from the photo, but the prints didn't bleed; the flannel fabric is a little fuzzier and some of of the brighter fabrics migrated a little onto the white. I was very excited by how bright the colors stayed after several washings and I am looking forward to using more of these Remix flannels in the future. You can find Robert Kaufman flannel here and here. The Windham flannel was just about as substantial feeling as the Cloud9. It did pill a very tiny bit after washing and also seemed to stay a little stiff, but it also had less fraying than any of the other prints. I think that this fabric would hold up well to continued washing and would make a great quilt back. You can find Windham flannel here and here. I was expecting to recommend some options and not others, but I would honestly use any of these options to back a quilt (other than the Joann's). I love using flannel as a quilt back because it is fuzzy and cuddly but breathes better than Minky since it is made from cotton. I hope that more prints are available in flannel in the future. If you have any questions or tips that you would like to share, I would love to hear them in the comments! This post is very interesting. Thank you for doing all the work! I've used good flannel before for backing and I'm glad I didn't consider any from JoAnn's. This is awesome! Thanks! I've been encouraging people to use flannel as quilt backs for months. I've had a great experience with both Riley Blake and Free Spirit flannels. This is wonderfully helpful! I have never used flannel as a backing but will definitely refer to this when I do. Thank you! I used to work in a lab testing laundry detergent, and did many loads of laundry, so I enjoyed hearing your scientific approach to testing the flannel. Well done! And thanks for the info. How interesting! Honestly, I've been too afraid of working with flannel as a backing because I was afraid of extreme pilling and stretching. But then again I've never worked with quality flannel. Now I know, thanks! That is fantastic information! Thank you for your research! I'm just about to use flannel for a backing, and it's on your good list. Yay! Great info! I have not used flannel but once and the pilling was awful...cheap stuff. I was hoping the nicer brands held up better but was nervous about that. 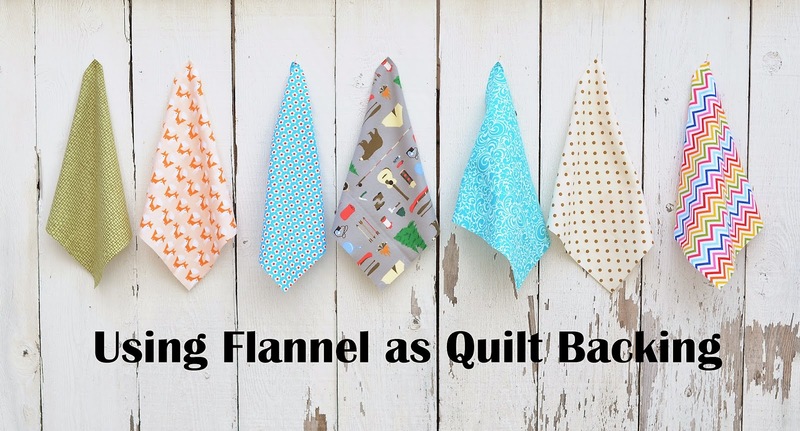 I have used flannel as backing on lap quilts for several years now. I have also tried JoAnns Quilters flannel (not the cheap ones as you mentioned) and they have held up just as nice as quilt shop quality flannels. Great post!! Great review - thanks. I have the same question as Amy - could I skip the wadding and just use flannel? Woderful review! Thank you for doing to research for us. I have one flannel backed quit that is my family's favorite. Another 1/2 way thru quilting as we speak. I think flannel is a great way to back them - and really enjoyed seeing the differences in manufacturers! Good research. I wanted to comment on JoAnn's flannels. I buy a lot of their flannel for baby projects and kids' chemo charity quilts (for use on front and/or back). As with any line, there are different weaves and quality within the line. Yes, some are a more loosely woven, less fluffy flannel that feel more like a homespun fabric. And then there are some marvelously soft feel even after washings with a normal flannel weave. I bought a bolt of one such purple print flannel last fall to make grand-daughters' pj bottoms...then the DILs wanted some also from the same fabric. Trust your eyes and especially your hands when you shop and you can still take advantage of the great pricing. Thanks for the review. I've never used flannel but your review makes it appealing and I appreciate not having to guess what to do with it. Thank you SO much for posting this flannel review. It is something that I have always wondered about. I appreciate your honestly as well as the 'scientific' approaches. Curious....are these flannels considered "quilting" flannels? My local store, not a quilting store, more of a big box type called Fabricland, has loads of flannels but I think they're mainly meant for sewing PJs, etc., and I'm always curious if there's a difference between those and what would be considered actual quilting flannel. Thanks for taking the time to do all of this research for the rest of us Erica! I live in Canada too, and I use Fabricland flannelette (as we call it here! ) almost exclusively, and I like how it works. Some of it is better quality than others, but you can usually tell by the feel of it. Thanks for the info. I have wanted to use flannel for back but once I found out about the shrinkage...I just dont' want to deal with that! I do buy only at Joann's as that is the ONLY store available to me! Their thin flannel is Snuggle something or another. That is not good for quilting anything! But there is a thin fleece that is thin enough that it feels like flannel but with a little pile that makes it really soft and cuddly. I have used that twice and the person really loved the back for being so cuddly! Perfect timing on this review. I will be using my first flannel backing on a winter-themed quilt this week and appreciate the info and tips. Thanks, Erica! Great post! Thank you so much for sharing. I have often thought about using flannel as quilt backs, particularly for children's quilts, but haven't been brave enough. This review is really helpful. Great review, thanks. I found it very helpfull and will try flannel for my next backing. Anyone ever use Michael Miller flannel? It wasn't part of the review so I was just wondering what others thought of it. Great information, thank you so much! I use JoAnn's flannel to make baby receiving blankets and always prewash to shrink. I would never use it to back a quilt I'd spent a lot of time to make but it's good to know that higher quality flannels make good quilt backings. The first quilt I ever made back in 2005 is backed with inexpensive JoAnn flannel. It's held up really well considering my family has grown to include a husband, 3 dogs, and 2 kids since I finished it. Thank you for going to this much trouble. I am curious as to why you recommend pre-washing your flannel. I just asked at my LQS the other day about this very thing and they told me not to pre-wash quilt store quality flannel. I know there are a million ways of doing everything; I just wondered what prompted you to recommend pre-washing. What a great post. It's so nice when people take the time to do these sort of info posts. It saves the rest of us money and waste, ruined projects etc. I have only used Robert Kaufman flannel and JoAnn. The RK is wonderful! Thanks again! Nice Review.. Really appreciate it. I am surprised at the differences in shrinkage width vs length. I make a lot of t-shirt quilts and several use flannel. I don't prewash, I use Moda Marbles or Shadowplay (Maywood Studios/EE Schenk). Have had great success with those. I have brought Joanns home a couple of times, but could never bring myself to use it. This was so helpful. Thank you so much!! Is there any reason not use cheap Joann's flannel instead of batting? I would never consider using it as a backing since it pills. Wonderful comparisons. thanks for taking the time and effort to do this. i love using flannel as backing and i use it exclusively for backing of my lap quilts. i've started hunting for flannel sheets on sale (so more seams in the backing) and have been very successful in finding cute patterns that, on sale, end up being less expensive than yardage. Any flannel can start to go "flat", to overcome this add 1 cup of vinegar just plain white vinegar, to your wash. This will bring the life back to the fabric. It releases the softeners from the fabric.